Item1991.028 item 299 - Catholic Ch. Streetsville, Ont. Item1991.028 item 301 - United Church, Cooksville, Ont. Item1991.028 item 302 - United Church, Cheltenham, Ont. Item1991.028 item 309 - C. W. Mack's Summer Home, Belfountain, Ont. Item1991.028 item 314 - A Summer Afternoon at Lorne Park Will you exchange post Cards? Item1991.028 item 315 - E. M. Clarkson's Store and PO. Item1991.028 item 316 - General View Clarkson, Ont. Item1991.028 item 317 - Dundas St. W., Erindale, Ont. Item 1991.028 item 309 - C. W. Mack's Summer Home, Belfountain, Ont. 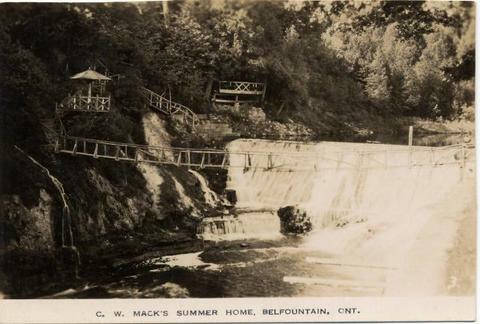 C. W. Mack's Summer Home, Belfountain, Ont.